Here's my entry for this week's CrowAbout challenge. No matter how hard I tried, I just couldn't get the image of a bee in a bonnet out of my mind! Stung with the bee of desire, this sweet little Victorian Miss has some heady choices to make. (Pardon the pun!) Temptation abounds. Will she or won't she succumb to desire? The faux lacing on the word, "Choose", represents her strait-laced upbringing and moral code of conduct. This 5"x7" journal page was created on a piece of recycled cereal box, gessoed, watercolored and collaged with six of the CrowAbout images supplied by Nancy Baumiller. The blissful couple is an image from Outsider Artists, and the pretty Victorian clipart is from Dover. I love your collage and the blissful couple! I loved the placement of the eyes and how it changes the face! So creative and clever! Good morning, Shelly! Thanks for trying again! Looks like we're both back in business. Have a wonderful day! I saw this on Flickr and it looks just as good here. 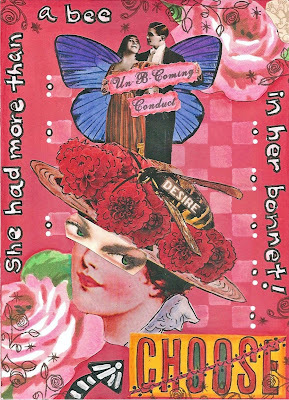 Love the idea of a bee in her bonnet.